Two rooms have reopened unexpectedly for this weekend and color is awesome! Take advantage of it all with a three night stay in Helen’s or Noelle’s Room and save 25% ofF your stay. Book Helen’s Room online or call 262-284-5583 to book either Noelle’s Room or Helen’s Room. Bring bikes and bike the Interurban trail (or rent bikes from ZuZu Pedals downtown. INDULGE IN PWI’S AWESOME BREAKFAST, TWISTED WILLOW IN THE EVENING (CALL 262-268-7600 TO MAKE RESERVATIONS AS THIS PLACE IS HOPPING BUSY!) WITH IN-BETWEEN HUNGER SATISFIED AT CHOCOLATE CHISEL (artisan chocolates and ice cream), BALTICA (teas, lunch, dessert and fair trade gifts….pottery from Poland), DOCKSIDE DELI, TELLO’S……..you will eat well!!!! We just celebrated our 46th anniversary and, in years prior to innkeeping, we often spent the first two weeks of August celebrating Dave’s birthday and our anniversary while on vacation. Most typically we vacationed at our modest lakeshore place on Little Spirit Lake which is part of the Iowa Great Lakes. On a map, the Iowa Great Lakes look like puddles compared to the Great Lakes we now know and love. But they afforded our family the opportunity to go to the beach, to row a boat, to fish, and to cook over a campfire; we have years of great memories! Often we made a trip back to our garden to harvest fresh vegetables to enjoy at the lake, and the lugs of peaches we would buy at Fareway were exquisitely sweet and juicy. One of the perks of being at the lake was that there was no phone! Imagine that…..no way for anyone to reach us. It was family time, pure and simple. What a luxury to experience those days. With only our appetites and the beach to impose structure on each day, they truly felt like ‘the endless days of summer’. summer took such a long time arriving that it has been short-changed. All the more reason for each of us to enjoy fall to the fullest! 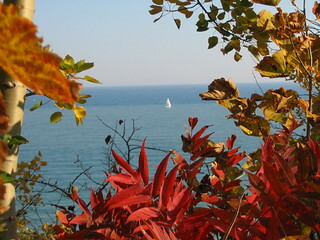 Here along the lakeshore, fall is extended, and it is truly a beautiful season to enjoy the outdoors. We are now offering single night stays (Monday through Thursday) at the discounted midweek rate during September and October. Weekends, single night stays may be booked one week in advance of arrival. All to help you take advantage of the lovely season of fall. Those of you who have been challenged by weather to get in your quota of biking or hiking this summer will love the Interurban Trail in September or October. As you may recall, Port Washington is approximately mid-point on the Interurban and Port Washington Inn is three blocks from the trail. We have a new restaurant in town! The Twisted Willow is making many people’s dining experience happy these days. We appreciate their atmosphere, their service, and their commitment to food that is fresh, creative, and reasonably priced. Port Washington also has a new lakeshore park, Coal Dock Park. It’s in its infancy, but the walking paths are in place and there is an aerial video that gives an idea of how this space connects to the marina area. Our W.J. Niederkorn library has collected images of the coal dock’s history. STAY LONGER gives you 25% off a three night stay. As the month of September draws to a close, we are eagerly awaiting news of the birth of our third grandchild. He is keeping us in suspense and making the distance between us and our daughter’s family seem even greater than usual (they live in Barcelona Spain). News of his safe arrival will indeed be cause to celebrate! It seems that this is a year of celebrations of all sorts. Another delivery we are eagerly awaiting as September turns to October is the new WBBA (Wisconsin Bed and Breakfast Association) Cookbook which features Port Washington Inn on the cover. Several of our favorite recipes are in this cookbook, and we look forward to trying those of other innkeepers, too. There will be many recipes innkeepers serve to their bed and breakfast guests but some family favorites as well. We’ll have a supply of these cookbooks at the inn as of early October. Autumn has arrived and that is certainly cause for celebration in a year of record breaking summer heat and drought here in the midwest. The cooler temperatures of autumn have never been more appreciated! Leaf colors are glorious in our area and we know only too well that autumn’s magical color display is fleeting and we must take advantage of it! Our Stay Longer Special continues to encourage three night stays (or longer) and is a win-win for our guests and for us, too. Our guests benefit from the savings and the lengthier stay the savings afford them; we benefit by getting to know our guests better as we visit over three or more breakfasts. Biking in the heat of the summer wasn’t so great, but biking now in the autumn is fabulous and a great way to enjoy the colorful leaves. Bring your bikes with you or rent bikes from ZuZu Pedals downtown Port Washington. Need gear? It’s here now at Duluth Trading Company which just opened their Port Washington store earlier this month. If you haven’t checked out our downtown recently, you are in for a treat as there are increasingly good options on offer in Port Washington. How many of you have visited Baltica Tea Room and Gift Shoppe? Pear and Simple? Victor’s Pier Street Shanty? Wardrobe Safari-Zing? The Chocolate Chisel? Dockside Deli? Okay……a few of these places have been here for awhile, because they make a lot of people happy! 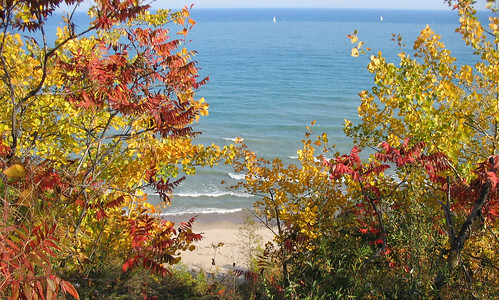 So, carve out an autumn getaway, make your reservations at Port Washington Inn, do a little holiday shopping while taking in the magic of autumn along Lake Michigan where autumn is extended by the warmth of the lake. Savor the savings and the good memories…..of time spent together, of delectable food shared with each other, of peaceful privacy and generous hospitality. It’s downright magical! Yesterday we took advantage of idyllic weather and a day without guests to venture to Kohler-Andrae State Park. Once again we were reminded of how very fortunate we are to live near two wonderful state parks located along the shores of Lake Michigan and within half an hour from us! It had been awhile since we had visited Kohler-Andrae and we had never visited the Nature Center there. The park includes six distinctive hiking trails, campsites, an amphitheatre, the beach, and picnic areas galore. We returned with sand in our shoes and a feeling of “September Serendipity”! Once in awhile we have last minute availability on offer and taking advantage of it can reap rewards! This weekend (through September 12th) Grace’s Suite is available for $30/night less than the normal room rate this time of year ($199 instead of $229). Heap savings on savings when you book for two nights and receive the 15% discount or three nights and receive the 25% discount. Catch it while you can and enjoy the private balcony with views of Port Washington’s art deco lighthouse out in the harbor! Book 1, 2, 3 or more nights online from this website OR call 262-284-5583! It would be the rare person who would describe their life as “a walk in the park” these days. Have you wondered about the origin of that expression? I would have to answer, “frankly, no!” But after taking a walk around Quarry Lake in Harrington Beach State Park on a beautiful day last week, the expression seems apt. Reconnecting with nature in a beautiful setting outside the parameters of the technology that rules so much of our lives can be, literally and figuratively, a breath of fresh air. Our lives can benefit from the balance that a ‘walk in the park’ and ‘a breath of fresh air’ can provide. Many guests at the Port Washington Inn either ride bikes or drive to Harrington Beach State Park, just 10 miles north. There are plentiful park opportunities in Port Washington, too. So a stay at the inn very often includes a visit to a park to enjoy Lake Michigan, or a nature center such as Riveredge Nature Center which is 10 miles inland from us. Take advantage of our multiple night discounts to take a walk in the park and draw a breath of fresh air! A recent guest who was giving herself a bit of time away from her normal routine affirmed as she checked out that it was the best investment she had made in awhile. Sometimes we need to reconnect, sometimes we need to disconnect; finding the atmosphere that makes it easy can make all the difference! You may book this promotion online by reserving your room(s) at Port Washington Inn, then choosing Bike Ozaukee County Promotion available under “Enhance Your Stay” OR give us a call at 262-284-5583! A recently discovered gardener’s delight is Paradise Gardens Nursery near West Bend. They aren’t new, we just found them! Rita ventured there and returned with enough culinary herbs to make for endless tasty fare this summer! And she will go back again and again to take advantage of their healthy well cared for plants and to enjoy seeing mature plantings in a beautiful setting. Landscape design is another part of their business and you will recognize their design talents the moment you drive in. They’ve created an idyllic environment. Just a few blocks from our Inn, you can hop on the newly upgraded Ozaukee Interurban Trail. This stellar paved trial traverses 30 miles of beautiful countryside in and around Port Washington. 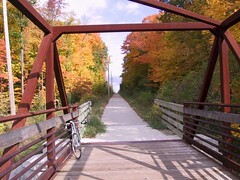 The Ozaukee Interurban Trail is ideal from a relaxing stroll, or a more vigorous bike ride. Wildlife sightings abound with deer, squirrels, rabbits, red-winged black birds, and an occasional flock of Canadian Geese. The south end of trail begins downtown, a block from the marina, and heads north through tree-lined areas and open fields. Once across the newly completed trail bridge across I-43, the trail heads out into open pasture-lands and farms. Pack a lunch, and relax along the trail for a picnic. We offer specials and discounts throughout the season to allow you to spend several days enjoying Port Washington and the outdoors.